On the heels of explaining the intricacies of human genetics in The Stuff of Life, the intrepid alien scientist Bloort-183 has been charged with covering the wider story of the evolution of life on Earth. Join Bloort as he takes King Floorsh and his son through a whirlwind tour of millions of years of history, from Earth's primordial soup to the first forms of life, from the four conditions needed for natural selection to the evolution of modern humans. The Cambrian Explosion and the Permian Extinction, symbiosis, and speciation - all are rendered clear, concise, and fun! Jay Hosler, a professor of biology at Juniata College and the author/illustrator of three graphic novels, lives in Huntingdon, Pennsylvania. Kevin Cannon and Zander Cannon, the illustrators of numerous graphic novels and comic books, both live in Minneapolis. 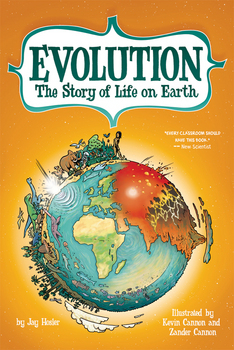 Illustrated by the brilliant duo Kevin Cannon and Zander Cannon, this volume is written by the noted comic author and professor of biology Jay Hosler.